So, if I can figure this out, you can watch my "Today" show segment here. On another note, while travelling near Boston, I saw this headstone. 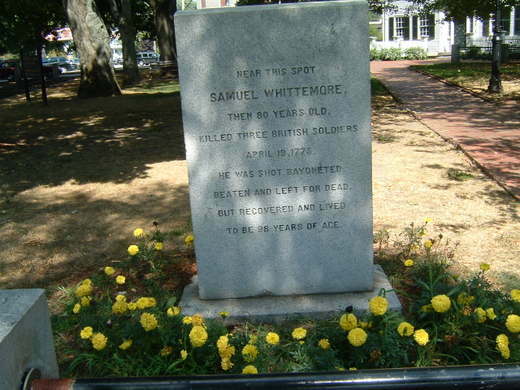 This guy could be a Boomer Hero for Our Time, if only he hadn't been dead for so long! Too bad nobody saved his DNA!! Today, I did a four-minute appearance on a local cable television show. 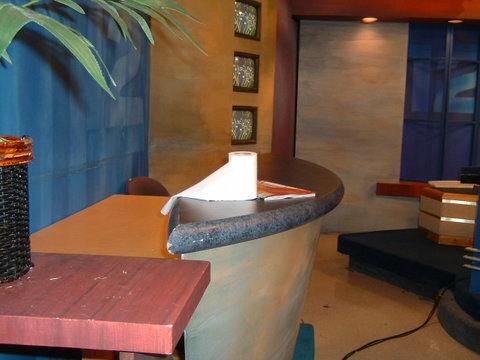 About the same as the spot I did on NBC's "Today" show, but nothing else was the same. This show is so local, by the way, that if it were any more local, it would be broadcast from my house, and would be available only to the homes on my block. First off, I had to drive there. 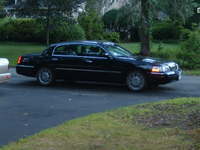 No limo from cable. Second, I had to buzz myself into the unmarked door, where a guy muttered "Daytime?" at me, and pointed down a dingy hallway. 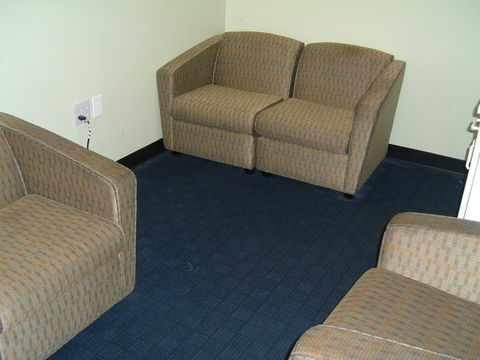 When I got to the "Green Room," I saw a small, brightly-lit room with two shabby stained chairs, and an equally filthy couch. I mean this was scary dirty, like I didn't want to sit down. No food, of course, but there was a Gevalia machine with cartridges for decaf--Yay! Also, there were 14 different varieties of tea. Go figure. The make-up area consisted of a large mirror, and a table surface, covered with magazines. Oh, and an unplugged hairdryer. I'd put on my own make-up, and worn my trusty pink suit, so I was uber-ready. A guy comes and leads me to the set, where two young-ish women are reading news off a teleprompter. Incredibly local news, like what Joe in Yonkers had for breakfast. A well-meaning, plump anchor girl comes over and tries to befriend me, advising me to look at her, and not into the camera. There are no camera operators around at all; the cameras are moving on their own, they are robotic, computer-operated cameras, apparently. I take some shots of myself on the set, just like I did on the "Today" show, but the tech guy gets really upset. He tries to take my camera away from me! I refuse. Here's a shot I took of part of the set. Note the roll of toilet paper. Classy! I do my three minutes, blabbing over the girl's silly, pointless questions ("When kids leave the roost, it's really tough, huh?"). 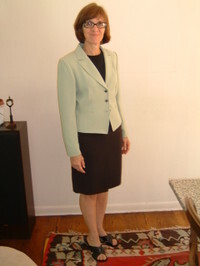 I manage to wedge in my Website, with correct spelling, www.DrCarin.com. Good for me. I'm over my "Today" show high. It's a major jolt of adrenaline to the self-esteem system to go on live national television and not make a stuttering idiot of yourself. I've been zinging along that self-induced chemical highway for the past few days. But it's over. Psssssssssssssssssssst. Like letting air out of a balloon. Meanwhile, although I am gearing up to promote Beyond the Mommy Years, and to sneak in surreptitious plugs for my marriage survey, I'm caught up in anxiety-provoking real-life mothering. The kind I thought was behind me. My son has been suffering from terrible, chronic migraines for the last month or so, and I have been dragging him from expert to expert, but he's gotten almost no relief. He's also constantly nauseous and dizzy, and has been mostly suffering in silence while sitting at home. He was supposed to go back to school tomorrow, to be a peer leader for an incoming-freshman program at his school. He had worked hard on the application for this non-paying job, and was quite proud when he was selected for the program. He has been looking forward to this week all summer long. But yesterday, he had to call the director to say that he wasn't physically able to participate. It was a mature decision, but a wrenching one. And I felt his disappointment as keenly as would have if he were nine years old, and cut from baseball team tryouts. Oddly, he views all this as his problem, not mine, and can't understand why I'm upset. Beyond the Mommy years, indeed. The joke's on me. This is the last post about the "Today" show: I promise. I took this shot from the "Green Room," a room which has no green whatsoever. 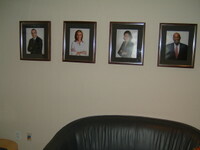 These head shots are of the real "Today" hosts, from the real weekday show. 1. You hear from old high school friends, some of whom you remember, and others of whom you have no recollection whatsoever. Mindy S., for instance, was a good friend, and I was thrilled to hear from her. She claims she was on her exercise bike while watching "Today"--funny how some people need a good "excuse" to be watching a morning news show! But Adam G., well, I have absolutely no clue who he is. He knew the name of my high school, and various other relevant details, but I could swear I never knew the guy. Ever. "I saw your interview on The Today Show this morning. Here's a question for you that you probably aren't expecting, but I would really like to know "What products do you use on your hair?" It looked fabulous! I am continually looking for product to smooth my frizzy hair! Could you help a girl out and reveal how you get your hair to look so gorgeous? Well, I'm flattered, really, but I had to tell her the truth. Which is this: my hair just wasn't, isn't, and will never be, frizzy. More important, the hair stylist for the "Today" show did a blow-dry on my dry hair that I will never be able to duplicate, ever. Moral: TV is not real life, even when it comes to hair. "I found your survey to be quite age-specific, and therefore I was not able to participate. I am not certain that that demographic was intentional." This complainer is a woman who is 70, and in her third marriage (!) to an 82-year-old minister. She couldn't answer the question about income, either, because "we're on Social Security and we have pensions from previous work, and the question seems to be about earnings," she said. "I'm curious why you are not interested in the opinions of single/divorced women and their feelings," another wrote to me. Actually, there's a lot in my book about single moms, but it's 400 pages long, and I had three minutes to summarize the whole thing. As for my other survey, on www.WhoDoesMore.com, that one is for and about husbands and wives, so single women just aren't on that agenda. 4. You hear from people trying to cash in. One guy offered to sell me a DVD or a VHS cassette tape of my appearance for $175. Geez. Doesn't he know that I'm TiVoLady? I TiVo'ed myself, saved it, transferred to tape, got a DVD, and plan to beg NBC for the video file they posted. (A great MSNBC link, but I have no idea how long it will work.) I hope this guy has a another day job. This television/radio/newspaper/Internet circuit is what it takes to sell books. The book itself is irrelevant: it's pimping the book that counts. Because it is my job to sell BEYOND THE MOMMY YEARS, I'll be doing radio shows at 11 p.m. (really, on WOR in New York) and at 7:30 a.m. on a Sunday (really, on a Philadelphia station), and on whoever else will let me make my book pitch. Also, if I'm really lucky, I may get another chance to do national television. But maybe not. Bonus Blog: Today (I'm) on "Today"
So, today I was on "Today." I didn't think I was all that nervous last night; nope, not me. I went to sleep at about 10:30, no problem. Then, I woke up with a start...at midnight. Wide awake. Only six more hours until I have to wake up. Six... more ... hours. And I started to count by the minutes.... At 1:24, still wide awake. Also at 2:43. Awake. Drifted off at some point when: HRRRRRRRRRRRR. Alarm at 6:00 a.m. By 6:15, the "Today" show car was in my driveway. In the almost-dark, way-too-early gloom of a Saturday morning. Inside this car, by the way, there is: a cell phone, bottles of water, tissues, rear satellite radio controls, folding seat tray, and a quiet, polite driver with a GPS who doesn't need directions. Best of all, I'm not driving. 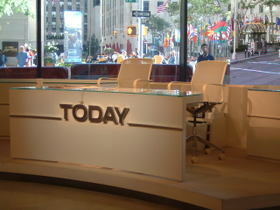 We get to Rockefeller Center, where the "Today" show studios are located, in less than an hour. It's fun to be chauffeured. Definitely. 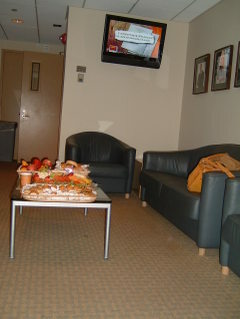 The Green Room is the place is most television studios where guests wait to go on camera. This one was painted white, and more than vaguely shabby. There were plates of food, including tiny muffins, donut holes, cookies, bagels, coffee, soda, water, and juice. Also, a fruit tray with melon, grapes, apples, bananas, oranges, pineapple slices, and, oddly enough, broccoli and cauliflower. Broccoli! Tensed up with tense tension, some anxiety, and anticipatory stage fright, I had no appetite. Especially for broccoli. A gloomy place to wait, with the television perma-set to NBC, and an intern so young as to point out that at the time of my first "Today" show appearance, in 1980, she had not yet been born. Okay, okay, don't rub it in. Then, they showed me to the hair and makeup room. This is my favorite thing about being on television: it's their job to make me look presentable. Telegenic even. The hair girl blow dries my hair dry--not a drop of water. And she does it while yakking to an exercise guru about having to work out six days a week and not three or four or five, in order to get the most benefits. Then, she points to the other chair, where the makeup lady makes a comment about my lack of interest in plucking my eyebrows. She works on my eyes and then air brushes makeup on me, with a gadget that looks exactly like a hash pipe, only she pours in makeup and aims it at my face. She tells me that with the advent of high-definition television, she has to use less makeup, not more, because every single dab and drop and line will show up on the screen. At one point, she is working on my face and the hair girl comes back to redo my do, and I think: I feel just like Cleopatra! I've got Grooming Minions!! Only, except of course, the ancient Egyptian queen was never on live television. Also, I was sitting in front of two drawers with identical labels. They said: "Today Show. Weekday Hair." Simple, yet explanatory. Still, if you think about it, what the heck is in the drawers??? More waiting around with Barely-Born Intern, then I go into the actual studio. Sit, get miked, and wait for my three minutes of airtime. I sneak in a photo of the studio. Here's what it looks like, from the inside out. Actually, the atmosphere on the Weekend Today show is much more laid-back and relaxed than the Weekday show. At least as I remember it. I've gotta say, it was fun. So, here I am, having fun, mingled with just a tiny frisson of terror. See my book on my lap? That's kinda like my security blankie. By the time I finished, everything was a blur. I grabbed some Today Frosted Flakes, a Today bagel, and some Today orange juice, got back in the Town car, and came right back home. Proceeded to spill my Today show orange juice on my Today show outfit in the Today show car. Welcome back to real life! 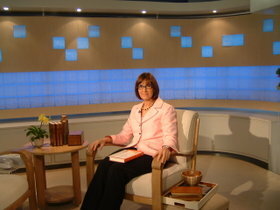 A producer called yesterday to conduct the "pre-interview" for the "Today" show interview. This is the interview that determines the entire course of the "spontaneous" and "unscripted" live segment of the popular morning news show. See these well-known faces? Well, I won't be speaking with any of them. I will be on "Weekend Today," kind of the minor leagues. But it's national television, and that's a good thing. Especially when you have a BEYOND THE MOMMY YEARS to promote. Anyway, when the producer called, we talked about my book for about 35 minutes, in great detail. By the end of the conversation, I had a long list of topics and stories to discuss on the show. Then, I asked how long my segment would last. Me: "So, how long will I be on the air?" Producer: "Oh, about three minutes." Let's see, that will give me enough time to say the name of my book, what it's about, and then, maybe 1.53 mom stories, at which point the host will be thanking me and moving on to the next story, about broiling watermelon or curing bad breath in dogs. Now you know: if I speak really, really fast, it's because there's no time left! Tune in Saturday, 8:00 a.m. to see me in either: mint green or shocking pink! I passed the test, I guess, because they decided to use me. First, there was t he "pre-interview." This is done on all the live talk shows, both then and now. The effortless looking, so-called spontaneous banter is actually carefully, and artfully, planned and scripted. The producer tells the guest what questions will be asked, and both guest and producer rehearse the answers. Sentence by sentence, in great detail. Second, I went out and bought myself a little red outfit: skirt, halter top, jacket. Although this was several decades ago, I still have it. It's a talisman, I guess, of my younger, more telegenic days. I appeared on the "Today" show in the spring, and I was interviewed by Jane Pauley. A month later, they invited me back, to discuss vacations during the summer season. This was, surely, a sign that I'd been a success: but at the time, I had no clue. I took it for granted that you did the "Today" show, and then you got invited to do it again. Since that time, I've appeared on "Oprah," "Good Morning America," "The View," "CBS This Morning," and several other national and local television shows. But I have a special affection for the "Today" show, since it was my first one ever. Fast forward several decades, to now. I'm scheduled to appear on "Weekend Today" this Saturday, August 18. I have bought two outfits, but I cannot decide between them. I no longer have the carefree assurance of youth, that whatever I put on will look fine. (It did then; it doesn't now!) Also, I have yet to hear from a producer, though they did send a film crew to video some women I gathered for them who discussed what it's like to send all your children off to college. I'm supposed to hear from somebody at "Today" today. I hope. Meanwhile, I can't decide: do I go with the muted mint green? Or the vibrant shocking pink? I have not a clue. Help!! Also, by the way, I'll need a lot longer to remember my "spontaneous" responses and jokes and comments about the book I finished writing exactly one year ago: BEYOND THE MOMMY YEARS. Quite frankly, it's all a blur. And I've got other things on my mind, too, like worrying about my daughter who's living in Rio and my son who's suffering from crippling migraine headaches, and trying to get 1,000 wives and husbands to answer my new survey. Assuming it all works out, though, you can look for me on "Today" on Saturday, August 18. More later on what time, and what I will be discussing. I'm leaning toward the pink.